This is a big sheet of flexible plastic coated with EL material so its like one big glowing square. Add a small inverter and you can add a cool glowing square to anything, clothes, shoes, anything. EL panel is the big sister to EL wire - it has the same glow effect but with a flat shape instead of a round shape. This is a big sheet of flexible plastic coated with EL material so its like one big glowing square. It emits an even glow over the entire shape. 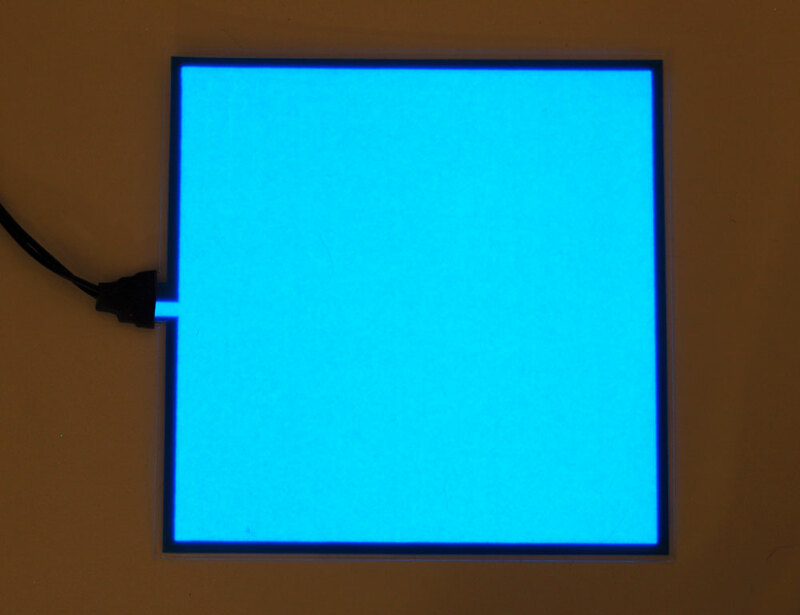 The glowing part of the panel is 10 cm x 10 cm (approx: 4" x 4"). There's a plastic coating is about 10.4cm x 10.4cm. Its covered in what seems to be PVC, the tape is thus weather-proof - but note that the connectors are NOT waterproof, just a bit of heatshrink. This isn't something we would suggest leaving outdoors for extended periods. You can attach it by sewing through the clear plastic edging, or gluing the back to a flat surface. It is flexible but will crease and damage if folded. You can cut the panel up as long as the shape you cut out is continuous and has the JST cable attached. This panel is a blue color when lit and appears blue when off.